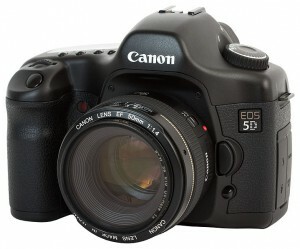 The Canon EOS 5D is a full-frame 12.8 Megapixel DSLR with good low noise at High ISO. It is my day-to-day camera, and up until recently, has been my camera for use for astro imaging too. The good noise performance at high ISO is down to the full-frame sensor. Packing fewer pixels per inch on a sensor minimises the cross-talk, and so the resulting noise. This camera is HEAVY. The camera itself weighs almost a kilo, and is built like a tank (cast aluminium alloy body, as with other ‘ProSumer’ level cameras in the EOS range. Recently, I’ve replaced this for astro use with a Canon 1100D. This is a cheaper camera, which I’ve actually had astro-modded (more about that on the 1100D’s page). The 5D is really overkill for Astro use, and I had no intention of modifying it, as it is my main DSLR for normal photographic use. However, if you have one it is an excellent camera, and as long as your focuser can take the weight, very suited for astro work. The picture used is licensed under the Creative Commons Attribution-Share Alike 3.0 Unported license. It is the work of Charles Lanteigne.